Relentless street walker, Yannig Hedel has been tracking the race of time on the urban architecture for 50 years, day after day, season after seasons, and offers us an extensive and coherent lifetime body of work. Yannig Hedel plays with scales and with classic photography codes. The viewer no longer knows how far away the photographed object really is. The play of light and shadow confuses the spectator and envelops him in a prodigiously silent and dreamlike feeling. PR Info _ Relentless street walker, Yannig Hedel has been tracking the race of time on the urban architecture for 50 years, day after day, season after seasons, and offers us an extensive and coherent lifetime body of work. While everything around him is accelerating, Yannig Hedel takes his time. And more precisely, he takes photographs of time itself! Street walker, he has rigorously captured the shadows, these ephemeral shapes made of light and time, to illustrate the passage of time. In all modesty, he has invented a new street photography, turning it into something formal, poetic and definitely silent. Born in Brittany in 1948, Yannig Hedel took up residence in Lyon at the age of 22. 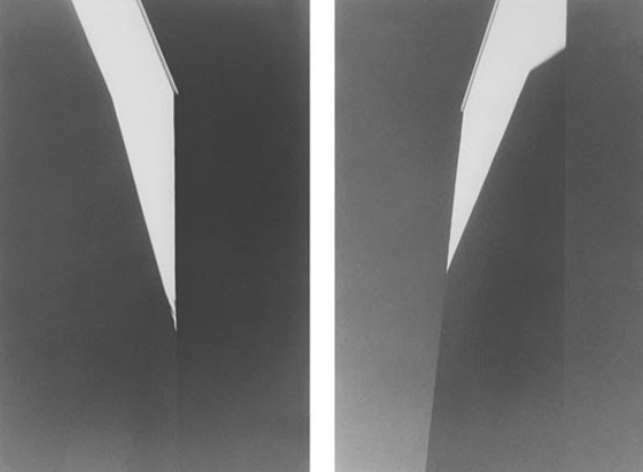 He then began a photographic journey that led him over time to collect in the city various geometric shapes, metamorphosing simple gables into pyramids, banal chimneys into monumental hourglasses. Yannig Hedel plays with scales and with classic photography codes. The viewer no longer knows how far away the photographed object really is. The play of light and shadow confuses the spectator and envelops him in a prodigiously silent and dreamlike feeling. Flirting with abstraction, his grayscale images are nevertheless very real! Whether he walks the street of his home town or as he stares at the city from his apartment window, Yannig Hedel pursues his relentless quest and offers us a never-ending enchantement. Since the 1980s, Yannig Hedel has done about thirty solo exhibitions and took part in more than forty festivals and group exhibits not only throughout Europe, but also in Mexico and Japan. The retrospectives which took place in Lyon (France), at the ‚Musée de l’Elysée‘ in Lausanne (Switzerland), and at the ‚Musée Réattu‘ in Arles, gave us the opportunity to fully understand his singular lifetime work, it being both obsessive and evolutive. His work is part of several private and public collections in France and abroad.